Este artículo o sección está siendo traducido. Puedes colaborar con la CreaciónWiki en la traducción desde el artículo original. Talk.Origins Archive is an anticreation website, which basically serves as the archive for posts made on the Talk.Origins Usenet newsgroup. The newsgroup is devoted to the discussion and debate of biological and physical origins, but most of the discussions in the newsgroup is centered on the creation/evolution controversy. In particular, the Talk.Origins Archive does not tolerate a young earth creationist viewpoint, and most of the content on the website is specifically targeted against this position. Transitional Vertebrate Fossils FAQ - responses to Transitional Vertebrate Fossils FAQ. Frequently Asked But Never Answered Questions - responses to FABNAQ. Grand Canyon discordant dates by Jonathan Sarfati. 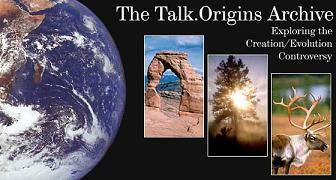 Talk.origins -- FAQ or Fiction? A critique of five Talk.Origins FAQs. Esta página fue modificada por última vez el 24 oct 2013 a las 10:36.